Some time in the next 6 years the world will experience an unprecedented cataclysm. Not a tsunami or an epidemic or a large scale war, although those are possible, too. This seismic shift will go undetected by the majority of the world’s population and yet it will change our lives. Between 2015 and 2020, for the first time in world history, the population of people over 65 will be greater than the population of children under 4. It’s all nicely laid out in a report issued a few months ago that didn’t get very much attention. I didn’t notice it at all. It was the US Census Bureau’s Report “65+ in the United States” and it consists of nothing but statistics. 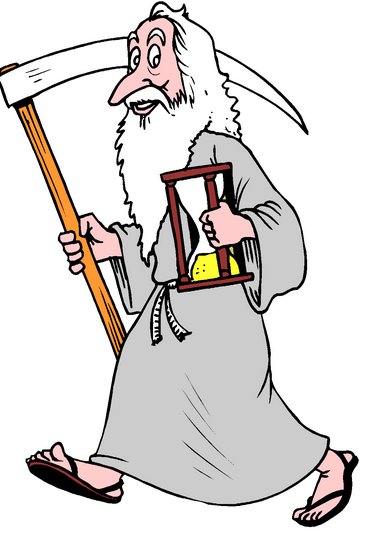 Most of the observations and the predictions are nothing new: the population of older people has grown (it reached 40.3 million in 2010); the median age is increasing (up from 22.9 in 1900 to 37.2 in 2010); life expectancy has shot up (going from 47.3 at birth in 1900 to 78.7 at birth in 2010 and going from 11.9 years at age 65 in 1900 to 19.2 years in 2010); more women than men make it to old age (in the over 90 set, there are only 38 men for every 100 women); the population is becoming more diverse: 84.8% of the population self-identify as white in 2010 compared to 86.9% in 2000). But buried amid the welter of interesting but not novel data about the US are some striking statistics about the entire world. First and foremost is the unprecedented demographic shift that will take place between 2015 and 2020: the total number of people over age 65 will exceed the number who are 4 or younger. This is because both fertility and mortality rates have been falling. 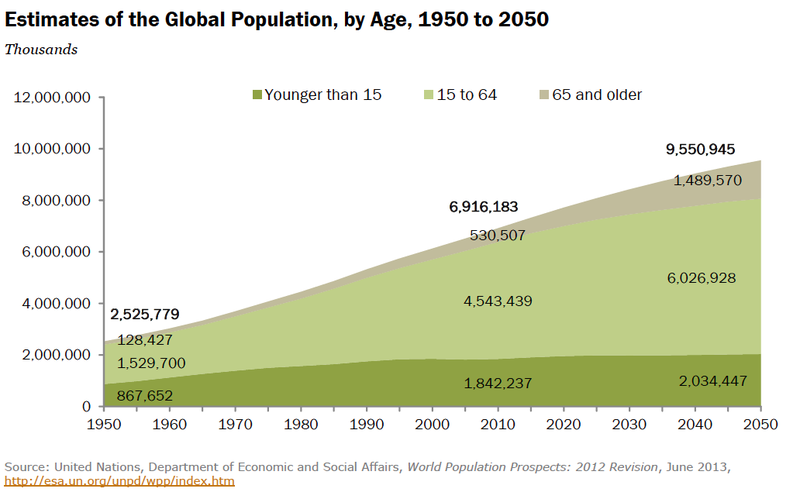 As a result, people over 60 went from 8% to 11% of the population between 1950 and 2011, but by 2050 they will make up 22% of the world's population--2 billion people. 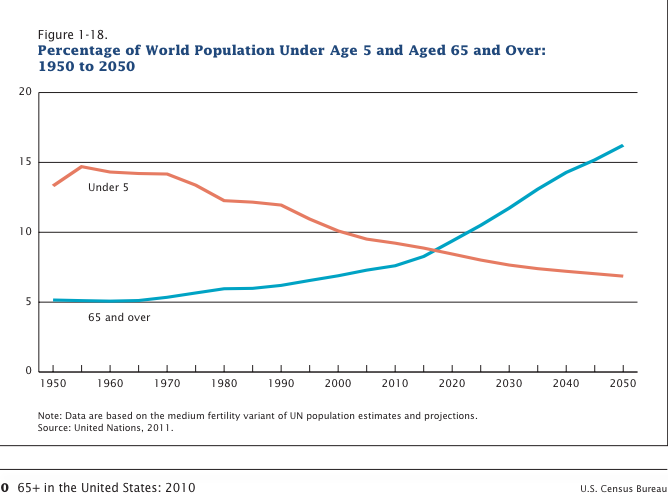 Looked at a little differently, the global population is projected to increase by a factor of 3.7 between 1950 and 2050, but during that same century, people who are 60+ will go up by a factor of 10 and people who are 80+ by a factor of 26. Today, the countries with the highest proportion of people over 60 are Japan (31%), Italy (27%), and Germany (26%) with 7 other European countries not far behind. 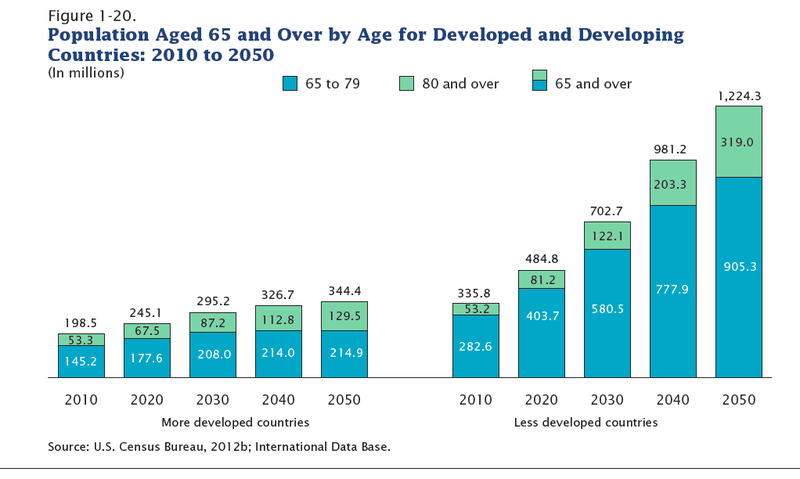 But the countries that are aging most rapidly include 4 in the Middle East (UAE, Iran, and Oman) and 4 in Asia (Singapore, Korea, Viet Nam, and China). 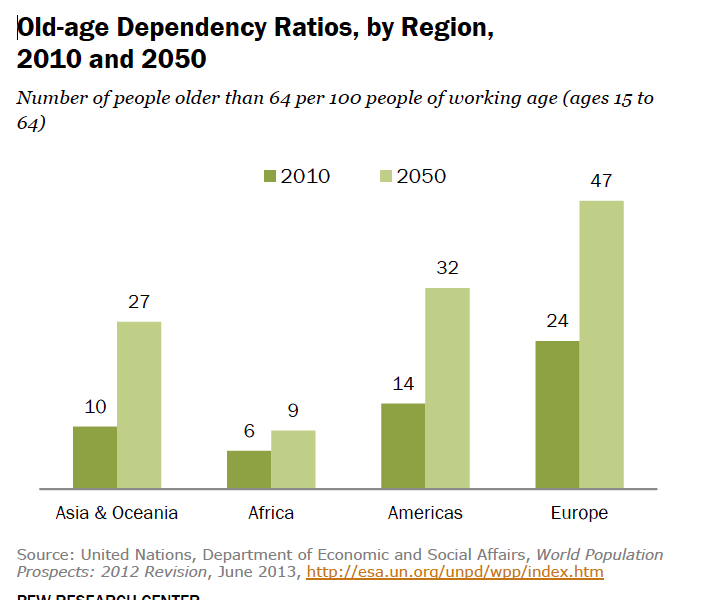 Accompanying the shifting age distribution will be an ever more dramatic dependency ratio: the number of people over 65 for every 100 people aged 20-64. This means that fewer and fewer young people will have to sustain more and more old people. And it will be in the low and middle income countries that all this transformation will be occurring most rapidly. The reason all this matters is that it will put an enormous strain—economic, medical, and social—on everyone, but especially on the poorest countries in the world. It will affect demand—for goods (more walkers than tricycles) and for labor (more personal care attendants than elementary school teachers). The net effect may be as destabilizing as nuclear weapons. As a position paper published by the State Department and the National Institute on Aging put it, global aging represents a “triumph of medical, social, and economic advances over disease”—but it also represents an enormous and most governments have not even begun to plan for the long term. So we have one more thing to worry about, along with climate change and religious fundamentalism and infectious diseases. What can we do about it? We do not need to accept the doomsday scenario of massive workforce shortages, asset market meltdowns, economic growth slowdowns, financial collapse of pension and healthcare systems, and mass loneliness and insecurity. But we do need to take steps now. There are lots of interventions that can make a difference. One is to raise the normal legal retirement age. Another is to use international migration. A third is to reform health care systems, incorporating new models of long term care. A fourth is to encourage businesses to employ older workers, enabling them to work part time and facilitating their continuing productivity through environmental modifications that address mobility, vision, hearing, and other deficits. Economists, sociologists, demographers, historians and physicians at places including the World Bank and the Stanford University Center on Longevity have come up with a menu of strategies. It’s up to all of us to pressure both the private and public sectors to act. Contact your senators and representatives. Write letters to the editor to major newspapers. The time to act is now. The new IOM report, “Dying in America,” is a masterpiece. Written in the matter-of-fact language typical of non-partisan reports by committees of experts, it makes recommendations with which no rational person could possibly disagree. Of course a few extremists have already gone on record as disagreeing: a spokesman for the National Right-to-Life movement was quoted in the NY Times as claiming that the report’s alleged focus on “cost slashing” would reinforce “well-founded fears” that advance care planning is intended to “push patients to accept premature deaths.” The truth is that the report says relatively little about cost and what it does say is simply that a side effect of following its recommendations, suggestions made in the spirit of improving the quality of care and assuring that patients’ wishes are followed, will likely be a fall rather than a rise in the cost of health care. While the recommendations of “Dying in America” are straight-forward and unobjectionable, they are also cleverly designed to be “actionable,” to lead to concrete steps to promote change. Its recommendation regarding the delivery of care states that “government health insurers and care delivery programs, as well as private health insurers, should cover the provision of comprehensive care for individuals with advanced serious illness who are nearing the end of life.” This is in marked contrast to the language of the IOM’s 1998 report, “Approaching Death: Improving Care at the End of Life,” which addressed the same theme by urging that “people with advanced, potentially fatal illnesses and those close to them should be able to expect and receive reliable, skillful, and supportive care.” The only way that patients can “expect” to receive this kind of care is if the delivery system provides it. I could just as well ask: What makes a book a best seller? Why do certain fashions catch on and not others? Publicists have their own ideas about how to sell books (which, speaking from experience, tend to be pretty unimaginative and outdated); Madison Avenue has its model for advertising campaigns and marketing strategies. Malcolm Gladwell, in his book “The Tipping Point,”itself a bestseller, argued that to create a “social epidemic,” you need 3 crucial kinds of people (connectors, mavens, and salesmen), you need to make sure the content is “sticky enough” to be retained by those who are affected, and you need to be sure the context is right. 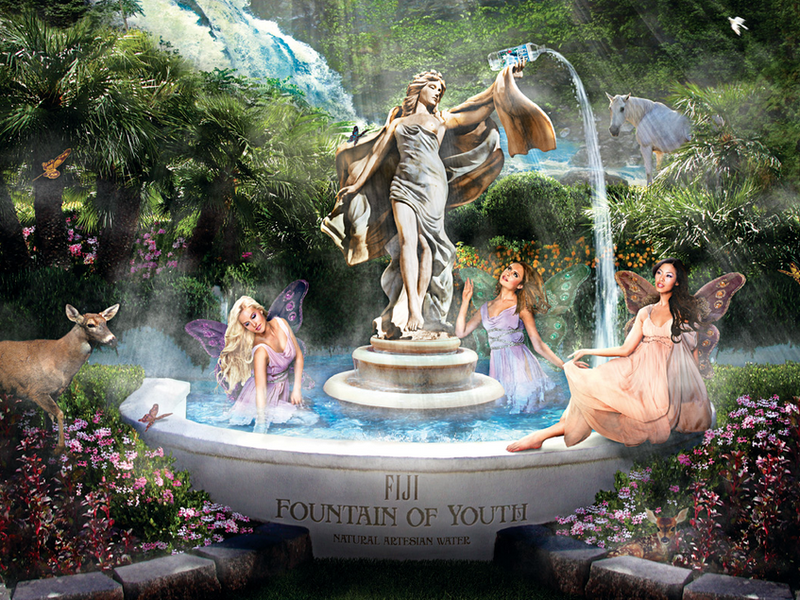 For an update on plans to locate the Fountain of Youth, see my next post. A buoyantly optimistic Paul Krugman proclaimed recently that Medicare’s woes are over—after a long period of seemingly relentlessly rising costs, costs that were rising so fast that they were clearly the major threat to the federal budget, Medicare per beneficiary expenditures actually fell last year. Economics guru and NY Times editorialist Krugman argues that the good news cannot simply be attributed to the recession because Medicare is a government program and therefore recession-proof. Now it’s dangerous to take issue with a force such as Krugman. But I want to at least raise the possibility that Medicare expenditures are not immune to the economic downturn because of the large amount of money that Medicare beneficiaries pay out of pocket for health care. And if a patient doesn’t get a drug prescription filled, for example, because his co-pay is too high, then Medicare does not have to pay for that drug, and expenditures fall. In this vein, a report released in July by the Henry J. Kaiser Family Foundation, “How much is enough? 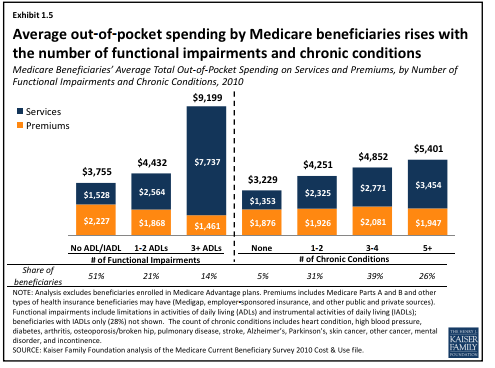 Out-of-pocket spending among Medicare beneficiaries: a chartbook” is very sobering. The main findings of the report (see chart in previous post) are that fee-for-service Medicare recipients spent an average of $4734 out of pocket for health care in 2010, up from $3253 in 2000--a 44% increase. Most of that spending is by those age 85 or older: they spent an average of $5962 out of pocket compared to only $1926 for those ages 65-74. And older people with 3 or more “ADL deficits,” or difficulties carrying out basic daily activities, spent a mind-boggling $9200 on health care, mainly on services. Out of pocket spending went to items such as Medicare premiums, other supplementary insurance, and long term care. In addition, 11% went to paying for prescription drugs as Medicare Part D has evolved since its inception to include more and more cost shifting to patients. 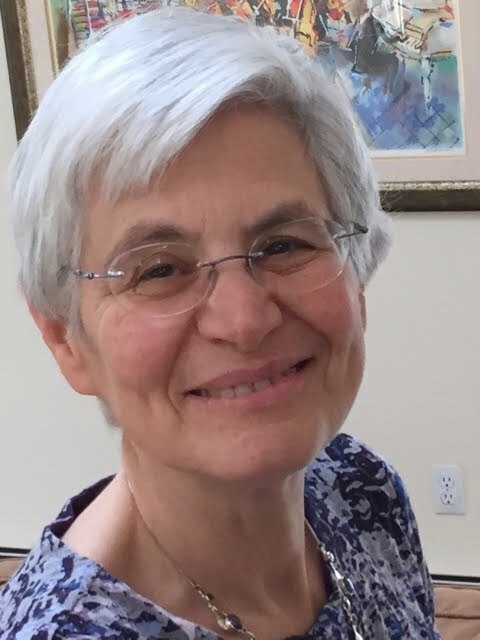 Interestingly, my colleagues at the Harvard Pilgrim Health Care Institute, just published a study in Health Affairs in which they present data indicating that older patients are increasingly skipping pills, taking less than the prescribed doses of medicines, or failing to fill prescriptions altogether in order to save money: among patients with 4 or more chronic conditions, they found that while 14.9% experienced “cost-related medication nonadherence” in 2005, this rate fell steadily until it reached 10.2% in 2009, and then it began rising again, reaching 10.8% in 2011. So it is entirely possible that the fall in Medicare costs reflects at least in part decisions made by patients to forgo particular pricey interventions. The result, predictably, would be savings to the entire Medicare program. 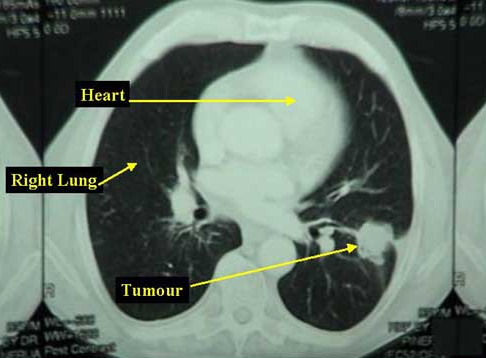 Now whether such choices made by patients adversely affects their health is another matter. The Health Affairs study assumes that non-adherence to medications is likely to lead to adverse health outcomes including worth health states and increased rates of hospitalization, especially in older individuals with multiple chronic conditions. They base their assumption on studies from the 1990s, principally conducted in the mentally ill and in Medicaid patients, that in fact showed that when patients did not take their medicines as prescribed, their clinical condition deteriorated. 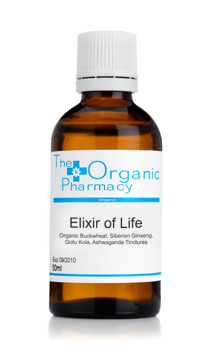 Whether the same would hold true for chronically ill older patients today is not so clear: there is ample evidence that older individuals with multimorbidity are at increased risk of adverse drug reactions the more medicines they take and that following the guidelines for all the diseases they have can cause falling, fainting, confusion, and other problems. Nonetheless, it would be preferable for physicians to make wiser prescribing decisions based on an understanding of physiology rather than leaving it to patients to decide which medications to forgo based on cost. Medicare expenditures are falling and it behooves us to understand exactly why and to evaluate the consequences. Whether the cost saving strategies of the Affordable Care Act are responsible, and whether the particular decreases in costs have had any effect on patients’ health and well-being, is yet to be determined. When I saw patients in the nursing home, I was hemmed in by the fact that Medicare had a very clear idea of what constituted an appointment with a nursing home patient. According to Medicare, a “visit” (billing jargon) entailed a face to face “encounter” (more billing jargon) between a “clinician” (in this case, me, the physician) and the patient. Starting in January, 2015, Medicare will pay a special monthly “complex chronic management” fee on top of the usual reimbursement to primary care patients who care for patients in the office. But somehow the nursing home environment is assumed to be immune from the need for this kind of supplementary support. Calls to family members and discussions with other members of the interdisciplinary team are supposed to be part of the “evaluation and management” services that are “bundled” into the Medicare fee schedule. So it’s thought to be perfectly reasonable for a physician to be paid $92 in 2015 for a nursing home visit for an acute medical problem such as a new pneumonia (code 99309). To merit this payment, the physician must provide documentation that he or she has taken 2 out of 3 possible steps: obtained a detailed history, performed a detailed physical exam, or engaged in “moderately complex” medical decision making. Only if the physician takes a comprehensive history, performs a comprehensive exam, and engages in highly complex medical decision-making can he or she bill with the code“99310,” earning the somewhat more generous sum of $136. For comparison, note that a gastroenterologist is paid on average $220 for performing a colonoscopy, a 20-minute procedure. No wonder physicians often respond to a call from the nursing home about a sick patient with an order to send the patient to the hospital for evaluation. Send a frail nursing home patient to the emergency room and he has, I would guess, about a 90% chance of being admitted. So instead of paying a physician an appropriate amount for making a visit to the nursing home and instituting on-site medical care, Medicare would fork out a minimum of $5774 (the base DRG payment) for a 5-day hospitalization, exposing the patient to the risk of iatrogenesis. Does this make any sense?